This is the next in a series began with Looking in the mirror tells our future. How has American invested in its future? What are the major investments the government has made in America, following the long tradition of canals, railroads, the Civil War, highways, and Apollo? This series looks at the 4 big investments of modern America. This post examines #2 (the good part is at the end). Nixon started the war on drugs in his Special Message to the Congress on Control of Narcotics and Dangerous Drugs on 14 July 1969 (source). This set forth all the major themes that have consumed so much money, diminished our Constitutional rights, and wrecked so many lives — with almost nil results. He declared the war on drugs on 17 June 1971. This post looks back at those days, the bold words of Richard Nixon — our Chief Social Engineer. Words which gave employment to thousands of policemen, secret policemen, attorneys, and social scientists. Note he does not use the phrase “War on Drugs.” He uses war-like language and declares a war against heroin addiction. Similarly confident speeches have been given by every President since then. But before we start, here’s a look at one metric of success (from Steven Taylor’s article below). I would like to summarize for you the meeting that I have just had with the bipartisan leaders which began at 8 o’clock and was completed 2 hours later. I began the meeting by making this statement, which I think needs to be made to the Nation: America’s public enemy number one in the United States is drug abuse. In order to fight and defeat this enemy, it is necessary to wage a new, all-out offensive. We must now candidly recognize that the deliberate procedures embodied in present efforts to control drug abuse are not sufficient in themselves. The problem has assumed the dimensions of a national emergency. … Therefore, I am transmitting legislation to the Congress to consolidate at the highest level a full-scale attack on the problem of drug abuse in America. I am proposing the appropriation of additional funds to meet the cost of rehabilitating drug users, and I will ask for additional funds to increase our enforcement efforts. … The Comprehensive Drug Abuse Prevention and Control Act of 1970 provides a sound base for the attack on the problem of the availability of narcotics in America. … To wage an effective war against heroin addiction, we must have international cooperation. In order to secure such cooperation, I am initiating a worldwide escalation in our existing programs for the control of narcotics traffic, and I am proposing a number of new steps for this purpose. Lots of drugs available on the street, of many kinds. Used by inner city folks with little fear of arrest. Affluent folks can use almost with impunity. As explained in these articles. The prison/jail numbers give us the world’s highest incarceration rate, according to the Prison Brief of the International Centre for Prison Studies. School of Law, King’s College (London). Our 753 per 100,000 beats Russia’s 609 (do you feel proud?). And that’s not even including the 5.1 million on probation or parole! What an odd way for a great nation to pour its wealth down the toilet. For nations as well as individuals, we are defined by our choices. Now, look here, Ma’am. You need to re-think this drug thing. It’s not going well. It isn’t going to go well. The Skirmish on Drugs may have seemed a good idea when Reefer Madness came out, or even in the Sixties a half century ago. Now, no. Everyone with the brains of a microwave oven knows that DEA serves only to keep prices up so that the narcos in Mexico can afford classy military weaponry and gorgeous mansions. It isn’t the fault of DEA. Starting in the mid-1990s, major American cities began a radical transformation. Years of high violent crime rates, thefts, robberies, and inner-city decay suddenly started to turn around. Crime rates didn’t just hold steady, they began falling faster than they went up. This trend appeared in practically every post-industrial American city, simultaneously. “The drop of crime in the 1990s affected all geographic areas and demographic groups,” Steven D. Levitt wrote in his landmark paper on the subject, Understanding Why Crime Fell in the 1990s, and elucidated further in the best-selling book Freakonomics. “It was so unanticipated that it was widely dismissed as temporary or illusory long after it had begun.” He went on to tie the drop to the legalization of abortion 20 years earlier, dismissing police tactics as a cause because they failed to explain the universality and unexpectedness of the change. Alfred Blumstein’s The Crime Drop in America pinned the cause of crime solely on the crack epidemic but gave the credit for its disappearance to those self-same policing strategies. Plenty of other theories have been offered to account for the double-digit decrease in violence, from the advent of “broken windows” policies, three strikes laws, changing demographics, gun control laws, and the increasing prevalence of cellphones to an upturn in the economy and cultural shifts in American society. Some of these theories have been disproven outright while others require a healthy dose of assumption to turn correlation into causation. 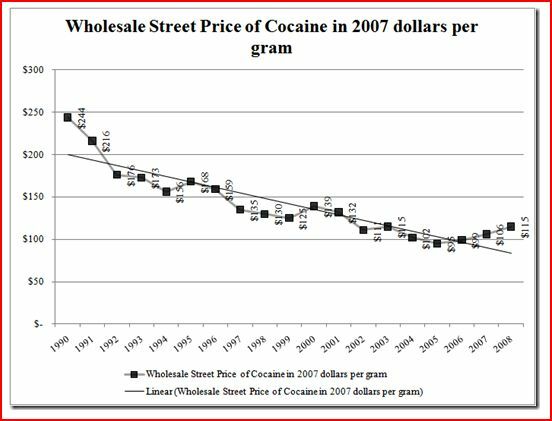 But much less attention has been paid to another likely culprit: the collapse of the U.S. cocaine market.